Birks finished level at 3 all with reigning champions Croydon Saturday at Jack Smith Park in a stunning display of attacking football. 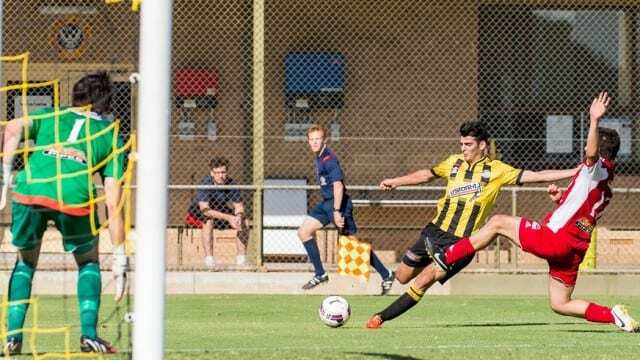 Birkalla went one up when Ryan Kitto crossed from the left just inside the halfway line to set Paul Radice up for a spectacular header – one of the goals of the season! Croydon levelled straight after halftime which sparked Birks into action again. Kitto continued his outstanding form and wreaked havoc through the midfield supported by Scott Nagel who was working hard down the left. Kurtis Rowe had another solid game in defence and has become very reliable along with JP Cirillo at right back. Jordan Watson got onto the scoresheet running onto the end of some terrific teamwork, a brilliant through ball that left him one on one with the keeper and he slotted it past him. All three goals were of the highest quality – the only downside was the defensive setup that saw Croydon score twice from corners with their third goal coming from a penalty. Harris Vuckic was re carded and we’re still waiting on the return of Andrew Ciarla (who played his first game in the reserves since returning from injury) and striker David Thornton who may still be a few weeks away. The lads travel to Roxby Downs this week to take on Comets. Sam Poynton was our special guest room steward for our game against Croydon at the weekend. He was visiting from Melbourne and when he’s in town he always comes along to support Birks.